All across the nation governors or former governors frequently attempt to make the transition to the United States Senate. Former governor Phil Bredesen, who is running for the Senate this year, is just one such an example. Nor is it particularly odd, at least in Tennessee, for a governor to wait some years before running for the U. S. Senate. Former governor Prentice Cooper waited fourteen years after leaving the governor’s office to run for the United States Senate; Lamar Alexander ran for the Senate sixteen years after departing the governor’s mansion. Bredesen is making his bid for the Senate eight years after leaving the governor’s office. Quite a few governors and former governors have aspired to win election to the United States Senate from Tennessee, yet to date, only nine have managed it. Out of those nine, only one has won election to the U. S. Senate since Tennessee began popularly electing U. S. senators in 1916: Lamar Alexander. Tennessee chief executives hankering to get to Washington had much better success when the state legislature still elected U. S. senators. The first Tennessean to have served as both governor and U. S. senator was William Blount of Knoxville and he only qualifies due to a technicality. Many Knoxvillians are familiar with Blount Mansion, Blount’s home in what is now downtown Knoxville. Blount was never elected governor of Tennessee, but rather was the appointed (by none other than George Washington) governor of Tennessee when it was a territory. William Blount guided the territory to statehood, calling a constitutional convention, which convened in Knoxville. Governor Blount attended the convention as a delegate from his home city. After Tennessee was admitted to the Union on May 6, 1796, Blount could have run for governor in his own right, but he faced a formidable obstacle in the person of John Sevier. Blount opted to seek one of Tennessee’s two seats in the United States Senate than risk a race against the popular Sevier. Blount also has the dubious distinction of being expelled from the United States Senate for a conspiracy involving Great Britain, plotting to seize territories which were part of European empires and motivated by Blount’s onerous debt due to his compulsive land speculation. Whatever reputation William Blount had enjoyed as a statesman was ruined by the scandal, winning the former senator condemnation from former president George Washington, who said Blount should be “held in detestation by all good men.” The First Lady, Abigail Adams, wife of President John Adams, lamented the fact Blount could not be sent to the guillotine and believed the scheme hatched by the former senator to be nothing less than a “diabolical plot.” Fortunately for William Blount, his reputation in Tennessee seemed little affected by the scorn heaped upon him nationally. Upon returning to Knoxville, Blount was feted by the people who held a parade in his honor. William Blount might have made a political comeback had not he succumbed to illness and died on March 21, 1800. Blount was only fifty years old. 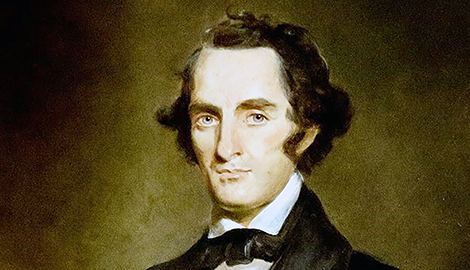 The second Tennessean to win election to the United States Senate after having been governor was James C. Jones, one of the most colorful figures in Tennessee’s political history. Standing 6’2 and weighing only 125 pounds, Jones was called “Lean Jimmy” by friends and foes alike. Jones was a formidable candidate being a highly entertaining and witty speaker in an age when it was one of the few ways a candidate could reach voters. After serving in the Tennessee House of Representatives, Jimmy Jones embarked on a campaign to unseat the personal protégé of the most venerable Tennessean of the time: former president Andrew Jackson. James K. Polk was governor of Tennessee and General Jackson’s favored apprentice when he sought reelection in 1839. Jones was a Whig and Governor Polk may well have underestimated the thirty-year old candidate when he agreed to a series of debates across the state. Most contemporary observers believed Jones won the debates; he also won the election, beating Polk by a whisker. Undeterred by his loss, James K. Polk was determined to avenge his earlier loss and faced “Lean Jimmy” Jones in the 1843 gubernatorial election. Although he waged an intensive campaign, stumping the entire state, Polk once again lost to Jones. The following year, Polk was nominated as the first “dark horse” candidate in our country’s history by the Democratic Party and won the general election by defeating the Whig candidate, Henry Clay. Even though he was eligible to run for a third term, Governor Jones chose not to run again, preferring instead to become the head of a railroad and make money. The former governor returned to politics when he was elected by the legislature to the United States Senate in 1851. Jones did not seek reelection to the Senate in 1856, as he was apparently in failing health. James C. Jones remained largely semi-retired and lived at his farm near Memphis until he died October 29, 1859. Like William Blount, “Lean Jimmy” Jones was only fifty years old when he died. Isham G. Harris, like Jimmy Jones, was a colorful and frequently a controversial political figure in Tennessee. Harris served as a presidential elector for Democratic nominee James Buchanan in the 1856 election. At that time, presidential electors actually waged campaigns on behalf of the candidates they supported. Harris stumped the state on behalf of Buchanan, while former governor Neill S. Brown, campaigned for Republican John C. Fremont. It was the first time a Republican candidate appeared on the ballot as the Whig Party had virtually disintegrated following the disastrous election of 1852 and the defection of party members over the looming secession argument and impending Civil War. Even some affiliated with the new Republican Party seemed dubious about its prospects for success. Nathaniel Banks, Speaker of the U. S. House of Representatives, refused at least one nomination for president and throughout his career had been a member of numerous political parties. At one time or another, Banks had been a Democrat, American Party member, a Republican, and a Liberal Republican Party member before once again rejoining the GOP. Banks’ elevation to the speakership had been hard fought and the House of Representatives was bitterly divided, not only by party, but also by region. Banks was elected Speaker of the House on the 133rd ballot. Banks would make a determined bid for the 1860 Republican presidential nomination, only to lose to a little known former congressman named Abraham Lincoln. Isham Harris was an able enough campaigner to make tens of thousands of friends across the state, as well as steal the spotlight from former governor Neill Brown. In spite of Andrew Jackson, Tennessee was not a solidly Democratic state at the time. For years the Whigs had more than held their own in the Volunteer State. James K. Polk had lost his home state in the 1844 presidential contest to Whig Henry Clay. In fact, Tennessee was only one of four states carried by Whig presidential nominee Winfield Scott in 1852. With the rise of Isham G. Harris, Tennessee’s Democratic Party also began a steady ascendancy. Harris was nominated for governor in 1857 and defeated his opponent with relative ease. Governor Harris was popular and his personal popularity was amply demonstrated in his 1859 reelection campaign. A conglomeration of former Whigs, as well as other fading political parties joined a number of disgruntled Democrats to form the “Opposition Party”, perhaps the most aptly named political party of all time. Harris was comfortably reelected governor while the Opposition Party showed surprising strength by winning seven out of ten congressional contests in Tennessee. When President Lincoln asked Governor Harris to raise 50,000 troops from Tennessee to crush the growing rebellion, Harris publicly snapped, “Not a single man will be furnished from Tennessee.” Isham Harris was governor of Tennessee when the state voted on a special referendum whether to secede from the Union. Tennesseans rejected the idea by a margin of roughly 68,000 to 59,000 votes in February of 1861. By June, opinions in Tennessee had changed materially. Tennesseans voted in favor of secession 104,913 to 47,238. Harris was taking no chances with his personal liberty, thinking it the better part of wisdom to flee to Mexico. Harris, along with other former confederates, offered to ally themselves with the Emperor of Mexico, Maximilian. The brother of the Austrian Emperor Franz Joseph, Maximilian had been placed upon the nonexistent Mexican throne by Napoleon III of France, who himself been elected president of the French Republic, only to restore the monarchy and proclaim himself emperor. With the fall of the Emperor Maximilian, Harris’ situation became problematic. When Maximilian’s government fell and the Emperor was subsequently executed by firing squad, Isham G. Harris once again fled, this time to England. Eventually, Governor Brownlow rescinded the warrant for Harris’ arrest. Isham Harris returned home to Tennessee and paid a call on the sour Parson Brownlow, who allegedly greeted the former governor by sneering, “While the lamp holds out to burn, the vilest sinner may return.” Harris moved to Memphis where he began a law practice. By 1877, Republican strength in Tennessee had ebbed following the Civil War and was largely confined to the eastern portion of the state. That year Isham G. Harris was elected to the United States Senate by the legislature. Harris consolidated his political position in Tennessee and was the acknowledged leader of the “Bourbon” Democrats. Isham G. Harris was routinely reelected by the state legislature, winning four terms in the United States Senate. Harris, although reelected in 1894, died in the middle of his term of office on July 8, 1897. No Tennessean had completed a fourth term in the U. S. Senate; that distinction would fall to Kenneth D. McKellar in 1940. One other man who had the honor of serving Tennessee as both governor and United States senator was Isham G. Harris’s predecessor as the Volunteer State’s Chief Executive: Andrew Johnson. Next week’s column will detail the stormy political career of the tailor from Greeneville.